Well here I am in France again and loving every minute of it. I keep meaning to do a blog in French but I rarely blog on this one so . . . maybe one day. I’m going back to Les Petits Points Parisiens. I’ll let you know how it goes. If it’s anything like it was the last time I was there, I’m sure I’ll love every second of time spent there and will buy mucho yarn. I mean, beaucoup de yarn, of course! Stop the Presses!! Paris Yarn Store with Sofa!! I just got back to my room in Paris after visiting Petits Points Parisiens. (24 rue Véron in Montmartre – Metro Abbesses) Wow. Finally. THIS is it. I finally found a yarn store in Paris that welcomes knitters and crocheters to come and sit a while. It’s something we often expect in the USA but it is no doubt difficult to do in Paris where space is at a premium and where the concept is rather new. The woman in charge today fills in occasionally and was there today because of the Créations Savoir-Faire expo in town. The owner was at the expo and was thoughtful enough to ask an English friend, Ellen, to keep the shop open for her. It was nice to find a shop in Paris where I could sit and knit for a while. They have coffee, many teas, and juice available and a restroom if needed. The shop is also guy-friendly. (Believe it or not, not every shop is.) I hope to go back soon and meet the actual owner, Anne. There was no compensation from the shop for this blog entry. No llamas were harmed but some sheep were annoyed. Okay. I said I’d never let my knitting become like my crocheting. I’d never have more than one or two projects going at a time. I’m sorry. If you’re all finished laughing and collapsing on the floor with cramps in your abs, you can sit up and take an ibuprofen for the laughter headache you just got. So now I’m getting out all the socks I’ve let jam up the knitting queue and finishing them. I don’t suppose it’s Second Sock Syndrome because in most cases I’ve either not finished the first sock or I’ve already started the second sock. 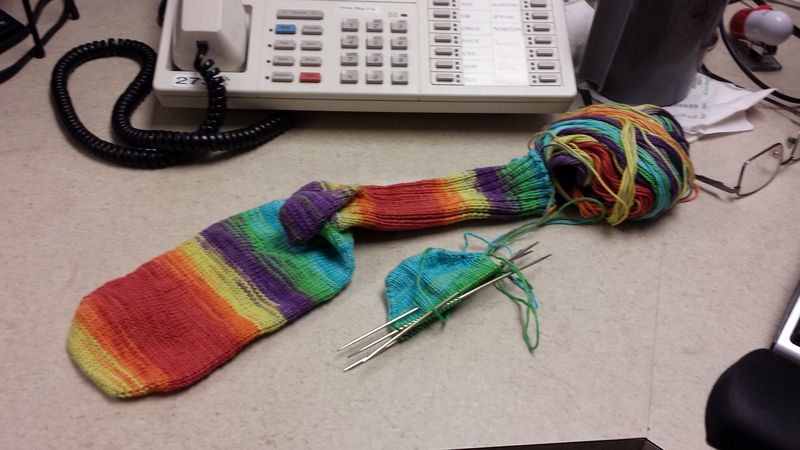 I figure I’ll be better able to concentrate on the Master Hand-Knitting Program from TKGA if I have a few UFOs cleared out of the pipeline and I can burn through socks pretty quickly most of the time. Wish me luck! Worth a thousand words . . . Sums it up okay for me. You?? The 1st Annual Tenntucky retreat was great! It was very well-organized and there were a lot of great people there. I just wish I hadn’t pooped out on people in the late afternoons. I actually fell asleep around 5pm on Saturday and didn’t wake up until early Sunday morning. Sometimes working nights can be a real pain. I get jet lag from NOT traveling. Sleeping at night doesn’t keep me from being sleepy in the daytime on my off time. So I missed some really fun activities but my sister, Kelly, attended them and had a blast. In any case, it was a great retreat and the Lake Barkley Lodge was as close to perfect as you could hope for. The staff was friendly and helpful and the rooms weren’t too far away. Each room has a balcony facing the lake and it felt like we were in a private cabin rather than in a large row of rooms. 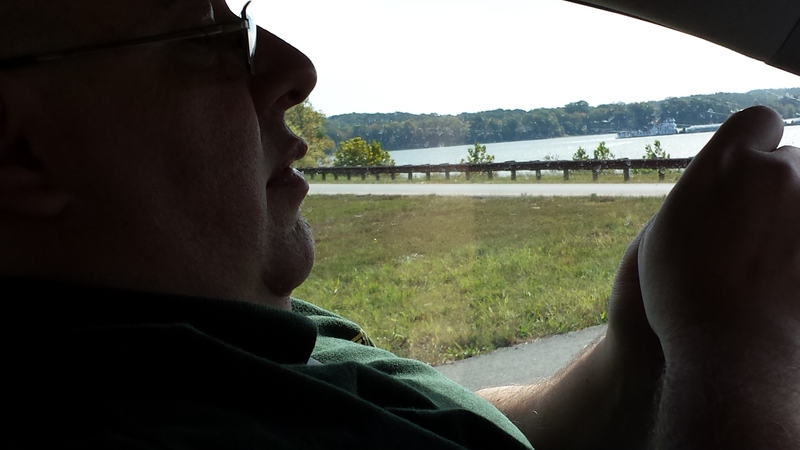 Kelly and I decided to run over to The Land Between the Lakes just to say we’d been there. Kelly had trouble with the hat she was working on so I stopped at a stop sign at one of the park exits. Folks were curious about the fat guy in the Prius who was sitting in the driver’s seat, knitting frantically. Hey, an emergency is an emergency! I kept expecting one of them to slow down and ask if we were okay. -Yes, I think I’ve got this. She missed a couple of increases but I think I’m getting it evened out correctly. -Okay, sir. Let me know if you need a knitting ambulance! Have a good day! If there were such a thing as a knitting ambulance, it might look like this. 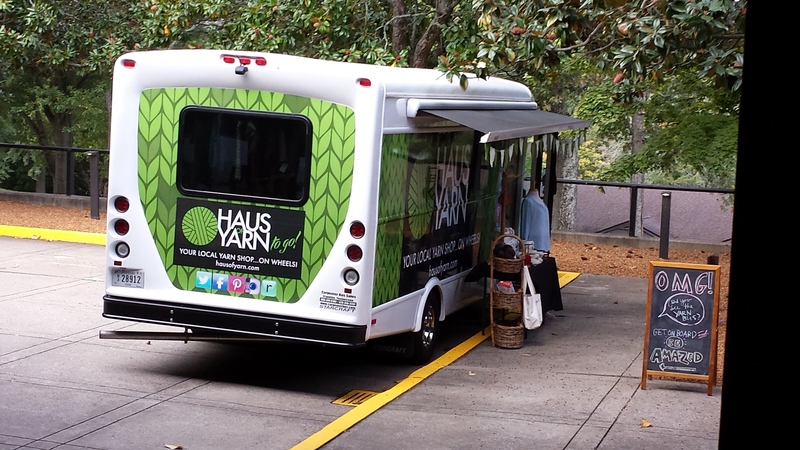 In a knitting emergency, it helps to find a state park entrance so that you’re out of the main traffic area.